A man sitting on a sofa was among four people who were injured after a car smashed through the side of a house and burst into flames. He was at home with his family when the white VW Golf crashed into the property in York in the early hours of Sunday. 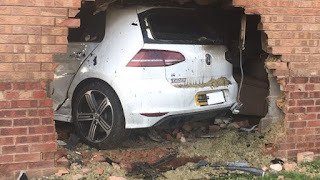 Images show the vehicle wedged inside the house after punching a hole through one of its walls. The man who was in the living room at the time of the accident suffered serious lower limb injuries and was taken to hospital, North Yorkshire Fire and Rescue said. His wife and young child escaped unhurt as the car caught fire, according to the emergency services. Three people had been inside the Golf and all were taken to hospital with head injuries. Fire crews tackled the blaze, which had spread to the house.